The patriarch of one of New York City's most prominent real estate families, Seymour B. Durst, was a bibliophile and an avid collector of New York memorabilia. His archival holdings--once known as the Old York Library and now the Durst Collection--reflect his fascination with the city's street grid, mass transit, port, parks and open spaces, as well as its monumental buildings and signature skyline. Kate Ascher is the Milstein Professor of Urban Development at the Graduate School of Architecture, Planning and Preservation at Columbia University and a principal at BuroHappold. She is the author of The Works: Anatomy of a City, The Heights: Anatomy of a Skyscraper, and The Way to Go: Moving by Sea, Land, and Air. 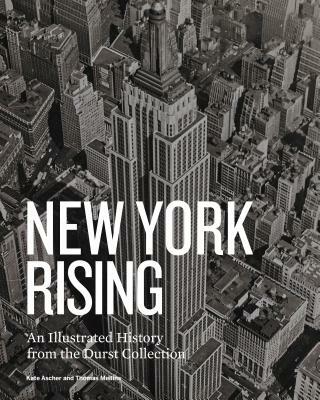 "Kate Ascher and Thomas Mellins mined the 35,000 items that the developer Seymour Durst’s family donated in 2011 to Columbia University’s Avery Architectural and Fine Arts Library to produce New York Rising: An Illustrated History From the Durst Collection. Maps, ephemera, photographs and other illustrations generously punctuate the 10 chapters on subjects ranging from “Moving the People” to “Remaking Times Square” and written by an A-team of municipal experts that includes Russell Shorto, Hilary Ballon (who died in 2017), Andrew Dolkart, Carol Willis, Ann Buttenwieser and Lynne B. Sagalyn."